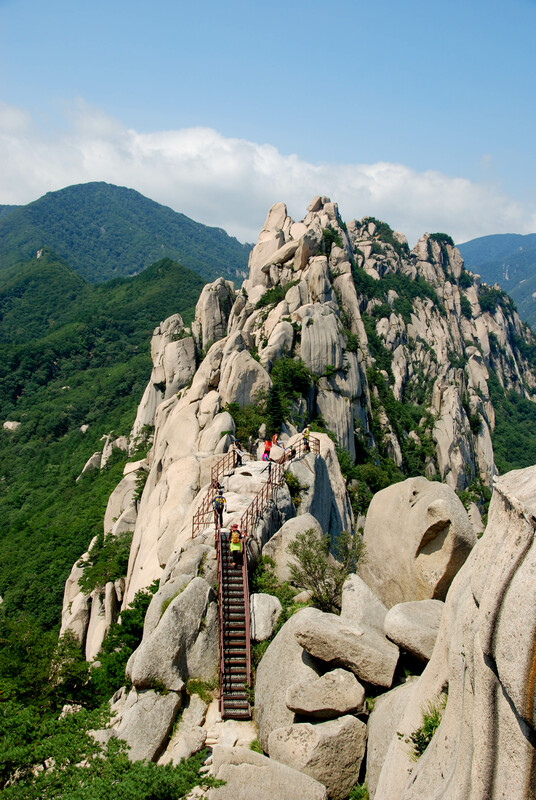 It’s no surprise hiking is really popular in Korea considering 70 percent of the country is comprised of mountains. There are 21 national parks in South Korea, which seems like a lot considering the country is the size of Indiana. 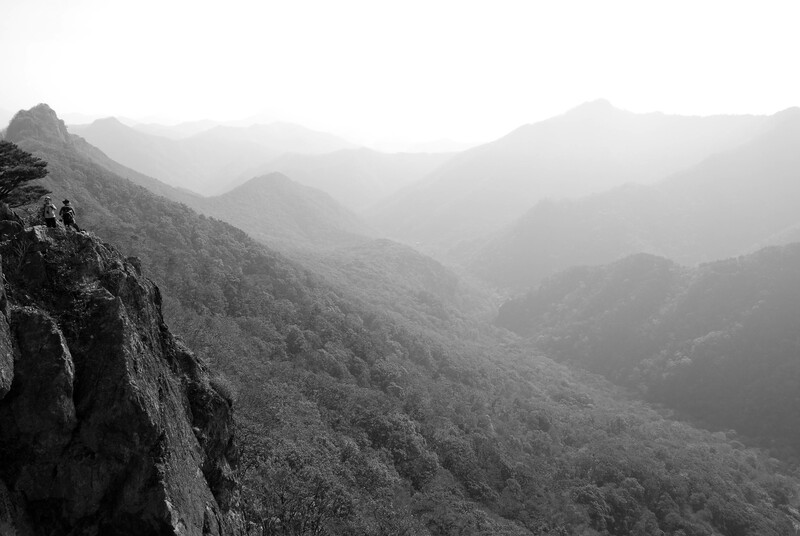 Jirisan was the first to be designated in 1967, and the Korea National Park Service was established in 1987. Knowing the park service was formed in 1916 in the United States, it’s a relatively new concept here in Korea. From what I’ve seen so far, the KNPS does an excellent job of maintaining them. While I’ve only been to three of the national parks so far, there are several things I’ve observed each time I’ve gone hiking. One of the first things I noticed was not about the mountains or trails themselves, but the hikers. I have yet to see a Korean on a hiking trail that isn’t decked out in the latest brightly colored hiking gear, head to toe, with matching backpacks and trekking poles. The difficulty of the hike doesn’t seem to matter, it’s all about the gear. Appearance is a really big part of Korean culture, so this isn’t shocking, but I’m still amazed by how much time and money they seem to put into their hiking outfits. This explains why there are so many outdoor apparel shops throughout Korea. 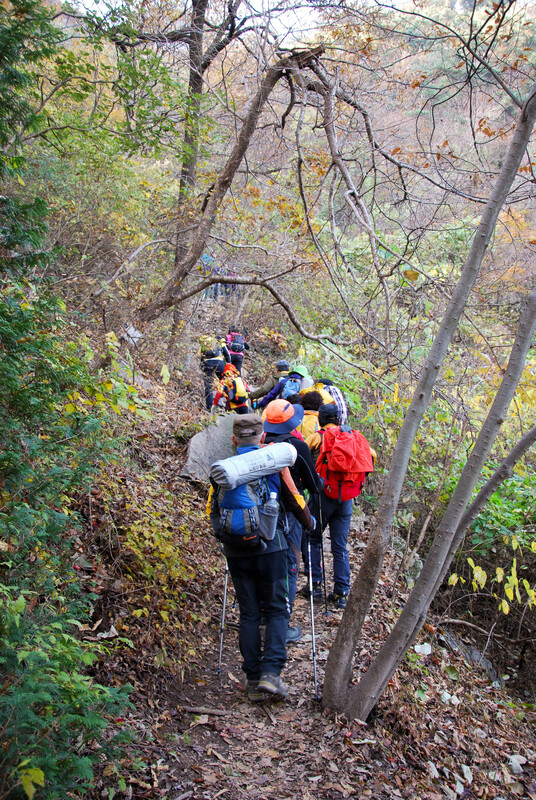 The first time I went hiking in Korea I wondered why I saw so many people carrying 50+ liter backpacks on a day hike. Then I reached the summit and discovered clumps of people scattered about, all huddling around gigantic spreads of food, rice wine and soju. I’ve learned that hiking in this country is not complete without a feast on the mountain. I assume this is why there are so many “rest stops” along trails that are basically roadside restaurants, just in case you didn’t bring enough food or drink with you. My peanut butter and jelly sandwich and bag of apple slices seemed quite pathetic after seeing so many elaborate mountaintop picnics. 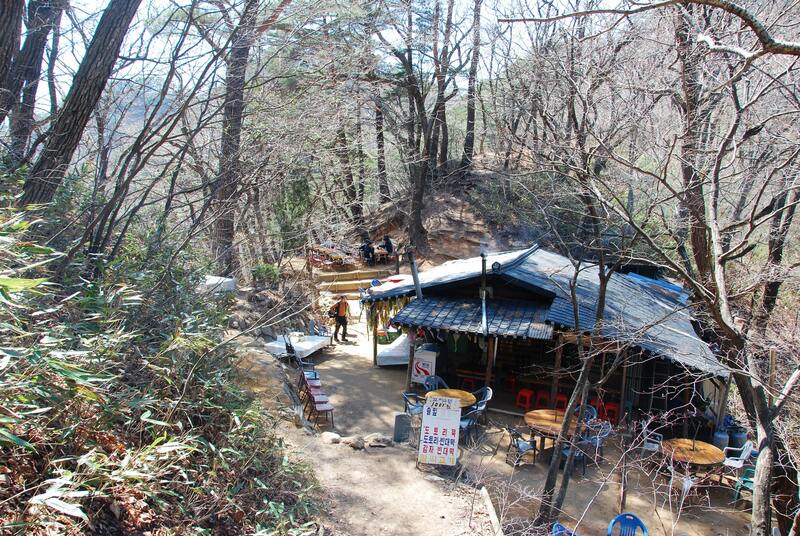 The food lover in me really likes this aspect of hiking in Korea. As a native Coloradoan and former resident of Washington, I can say the mountains in Korea seem a little puny in comparison to 14,000 foot peaks. However, I don’t think Korea knows about the secret of switchbacks. They prefer to just plow straight up the mountain making many of the hikes here a bit strenuous. This is where I should mention the majority of hikers I see here are older. And by that I mean it’s rare to see people under 40 taking pleasure in day hiking (not that 40 is old, but I’ve hardly seen anyone in their 20s or 30s on the trails here, unlike what I’m used to seeing back home). Claustrophobic is not a term I ever thought I would associate with hiking. 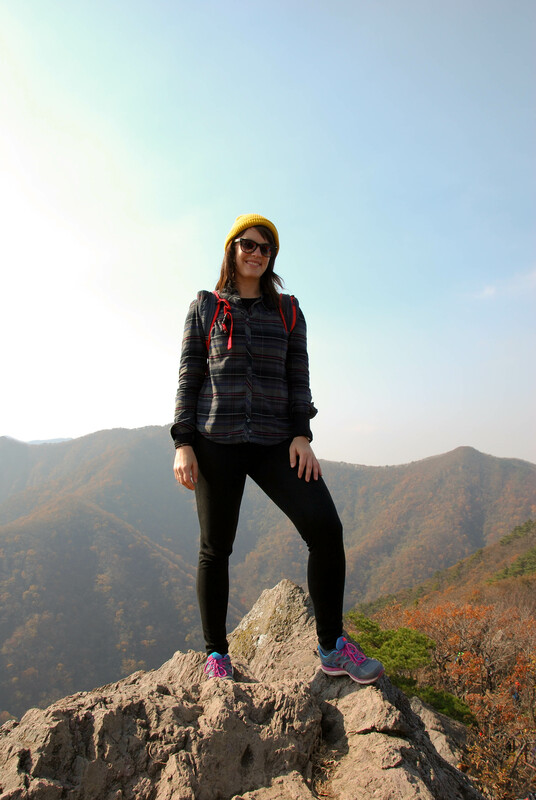 That is, until I went on a few fall hikes in Korea. There have been times when the trail has been so crowded there’s been no where to go and no way to get around all of the people. I have actually been pushed and shoved on crowded trails here, and I have had to wait in line to finish hiking the last half kilometer to the summit because there are so many people. I’ve also nearly had my eye poked out more than once by other people’s trekking poles while trying to navigate through what I decided to call hiking jams. It’s great to see so many people being active and taking advantage of the outdoors, but didn’t we all come here to escape the hustle and bustle of the city, to listen to the trees blow in the wind, to be quiet with nature and our own thoughts? There have been a few instances where I’ve felt just as stressed about being on a mountain side as I have in an overly packed subway car. Perhaps I’ve just chosen the most popular trails during the most popular hiking season a few too many times. I also rely on public transit to get me places, making it harder to access spots that are a little more off the beaten path. Thankfully, not all of my hiking experiences have been this way, but more than I’d like have been. In the end, no matter how crowded the trail is or how under-dressed I feel, no matter how big or small the mountain is, it always feels good to conquer it. I hope to climb a few more before before my time in Korea comes to an end. 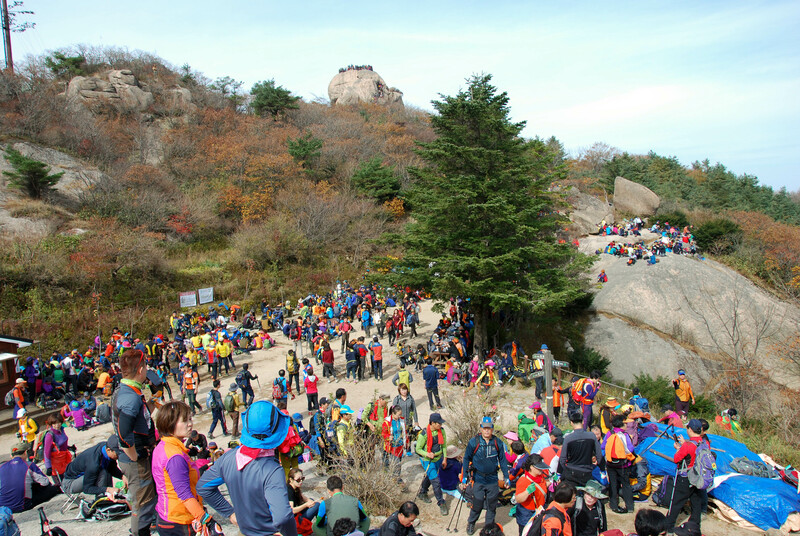 A crowded day at Munjangdae Peak in Songnisan National Park. 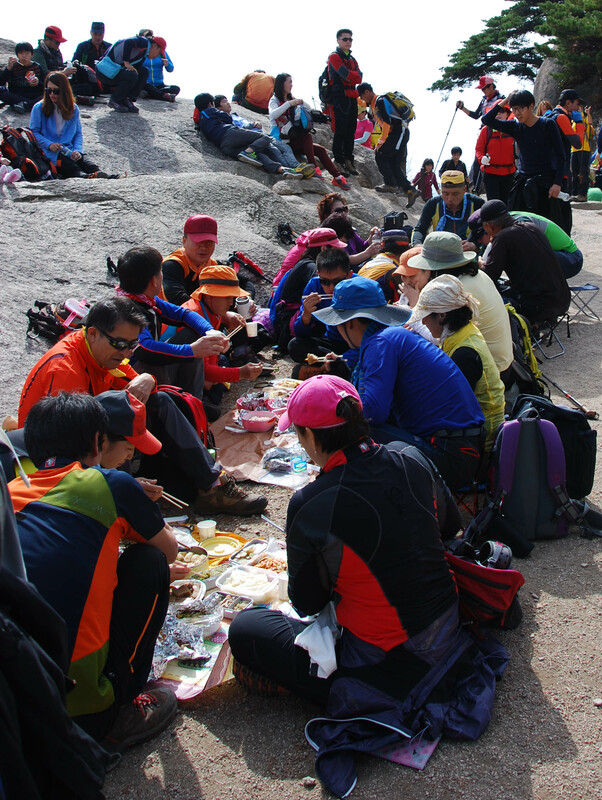 Hikers feasting in Songnisan National Park. A rest stop in the middle of a trail on a quiet day in Songnisan National Park. Day hikers making their way up to eat and drink on the mountaintop. 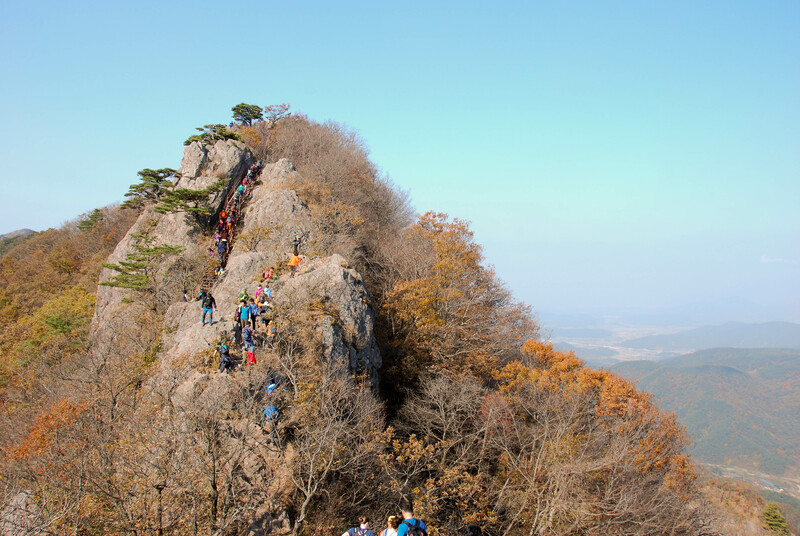 Another crowded day of hiking, this time in Naejangsan National Park. Several peaks I’ve hiked here have ended with stairs leading to the top of a rock. 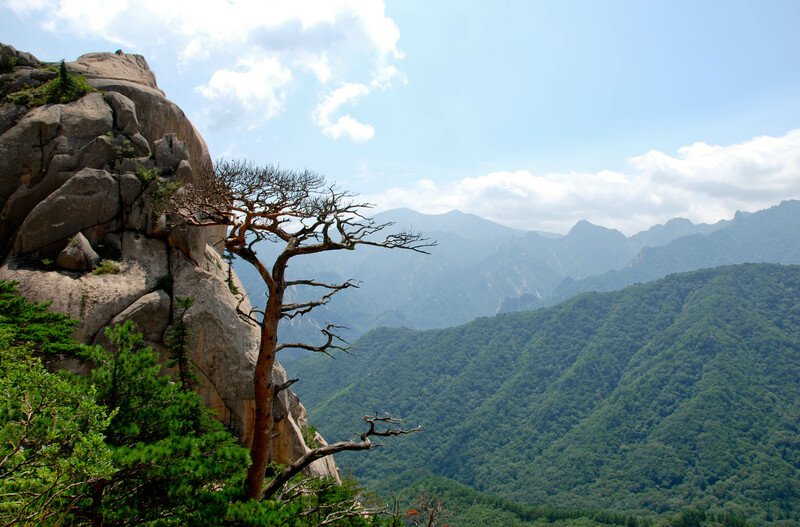 This is in Seoraksan National Park. Thanks for your narrative, Emily, and the beautiful pictures. It looks like you could use a horn on those trails when you want to pass. Love the colors! I feel the urge to update and accessorize my travel clothes.